★ MATERIAL:95% COTTON,Men's Chino Jogger Pants super soft body fabric,premium soft french terry blend, durable quality and comfortable. 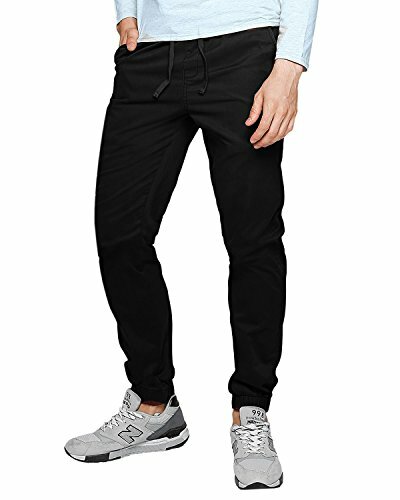 ★DESIGN:Men's Workout Trousers elastic waistband.Gathered Cuffs and Twill design,Chino pants are tapered style sweatpants designed to have a slim/skinny fit compared to loose fitting sweatpants. The leg cuffs fall just above the ankle. ★ NOTICE:We do not use the Amazon's size chart, please kindly check the size charts image and Double Check Your Size with Our Size Chart before You Buy it. Size may be 2cm/1 inch inaccuracy DUE TO HAND MEASURE. Color may be little different due to monitor. ★ OCCASSION:Suitable for Spring,Summer,Fall and Winter for Work ,Dating ,Daily ,Home and Sport.Perfect match with your favorite Shirt, Hoodie, Sweater. ★ CHOOSE:Chino Pants come in a wide range of color and size choices to help suit everyone's personal preference.